The aircraft carrier Hornet (CV-12) is the eighth ship of the United Stated Navy to bear the name. Six earlier Hornets date from 1775, but CV-12’s greatest legacy comes from the seventh Hornet (CV-8). 1775 - The first Hornet is christened. Hornet would become one of the most distinguished names in American naval history with her performance in the Revolutionary War. The first two ships in the new Continental Navy were Hornet and Wasp. 1805 - In a one hour gun battle, the second Hornet, along with another sloop, battered the canons at the citadel at Djerna, damaging one of the walls enough to allow the Marines to rush over it and capture the citadel, thus deciding the war with the Barbary Pirates. 1942 - The seventh Hornet (CV-8) launched 16 Army B-25s to strike the Japanese home islands in one of the most daring raids in the history of warfare -- the "Doolittle Raid." She went on to fight at the Battle of Midway and was lost to an overwhelming air attack at the Battle of Santa Cruz. 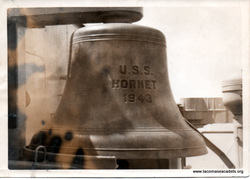 1943 - The eighth Hornet (CV-12) was commissioned just 15 months after her keel was laid. The USS Hornet CV-12 is one of the 24 legendary Essex-class aircraft carriers built during and after World War II. Built at Newport News, Virginia, and the eighth ship to be named “Hornet,” she is one of the most decorated ships of the US Navy. For 16 continuous months Hornet was in action in the forward areas of the Pacific combat zone, sometimes within 40 miles of the Japanese home islands. Under air attack 59 times, she was never seriously damaged. Her aircraft destroyed 1,410 Japanese aircraft, only Essex exceeded this record. Launched the first carrier aircraft strikes in support of the liberation of the Philippine Islands. Hornet participated in World War II, the Vietnam War, and the first moon missions. USS Hornet is designated a State Historic Landmark; 1999. The F/A-18 strike fighter carries on the name of Hornet in today's NAVY.